So a massive drop on the day in the US session, worth taking a step back and looking again at the weekly chart we see Dow currently held up at it's weekly support level with price looking to have bottomed out on the shorter time frames for now. Dax has been halted at it's monthly support level while Nikkei has returned to it's long term resistance levels having broken out several weeks ago. 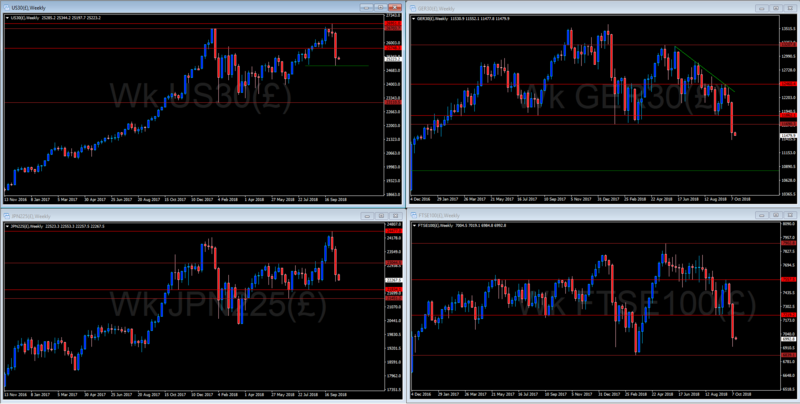 FTSE has cleared it's weekly support zone but still a long way from it's monthly support level. Should be a very interesting day tomorrow. or is this the real thing with a long term top and a bearmarket? But yes I can see the neckline and it's not too far away and also seeing the drop is continuing into the US close and Asian open. Just noticed the mistake in the pic in post above, the figures should be 2000 not 200. 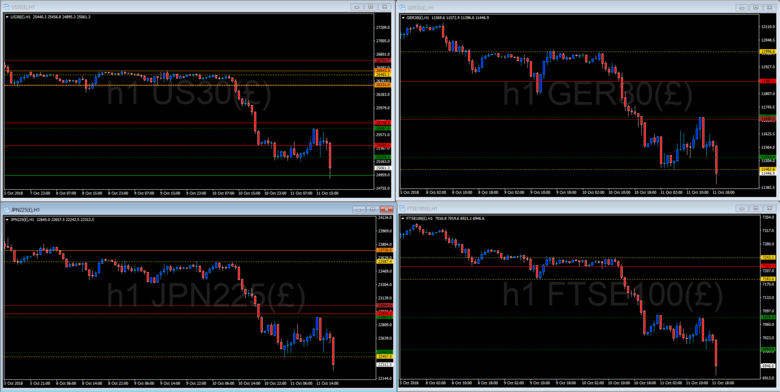 Some further downside overnight halted at 3am bst but Dax and FTSE look to be itching to go further this morning while Dow looks content with 25177 for now. One additional thought about all this. If this is the end then why hasn't USD taken off? 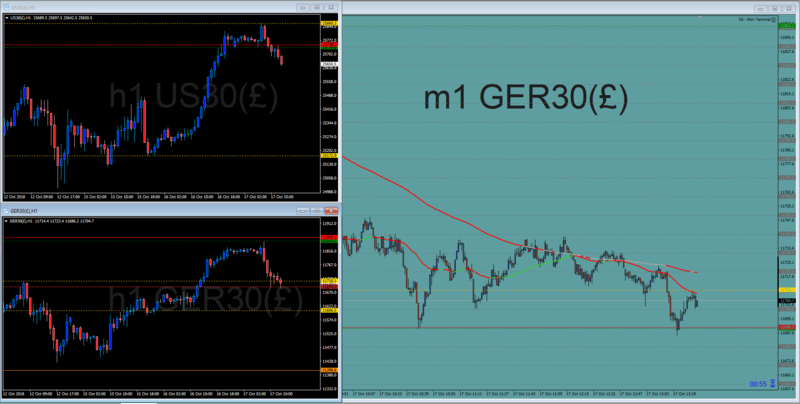 It may yet of course but so far it has gone in the opposite direction, albeit only in a small move. Maybe it has all gone into bitcoin? 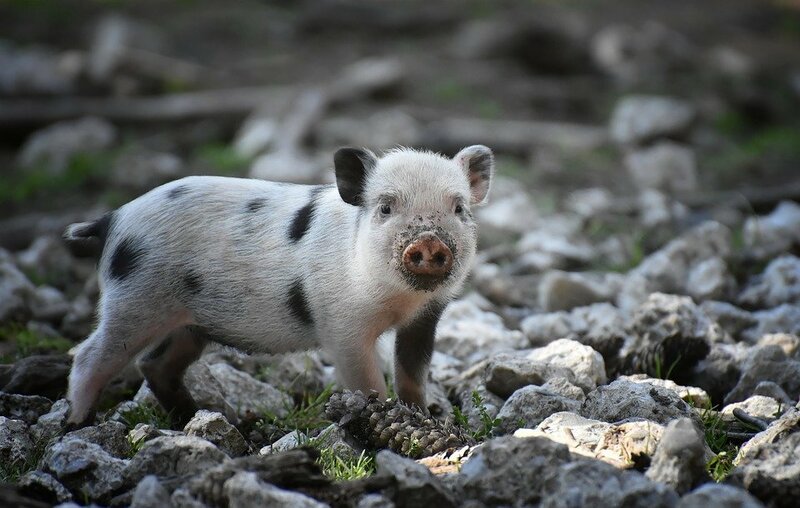 (Ah! maybe not... - sorry couldn't resist ?). 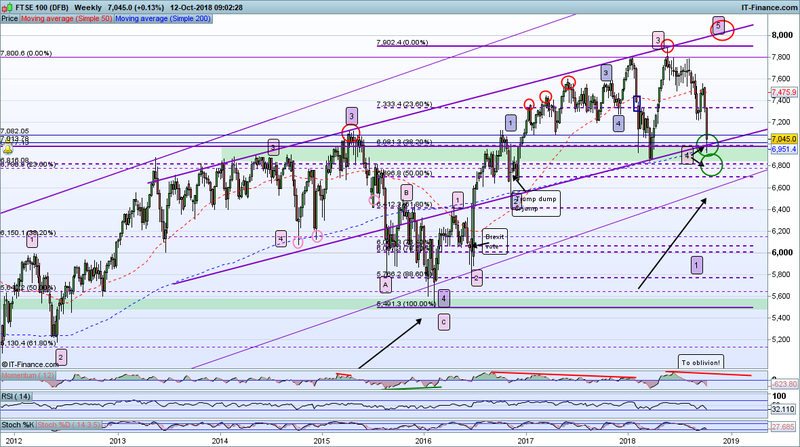 Therefore I remain cautions about jumping on the Bearish bandwagon (which as a perma bear is saying something I recognise!) there will always be another opportunity. I am sticking with my road-maps on FX and therefore also on everything else for now until the market confirms it of tells me something else is happening. 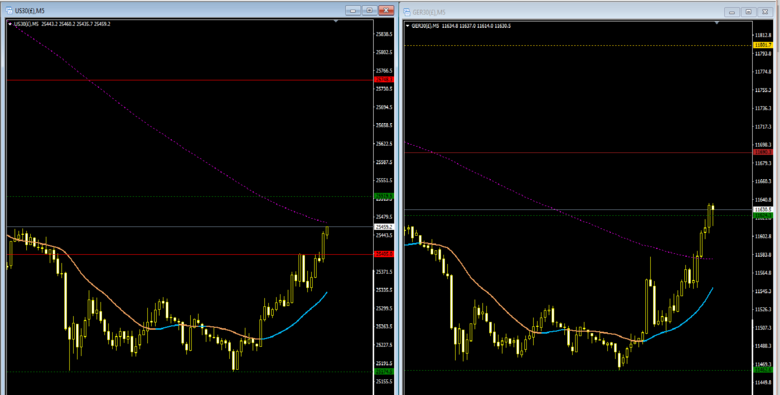 True enough the rout was started on the US open yesterday and then continued round the globe/clock. There was a push down attempt on the US open in 4 of the last 5 sessions and I'm just looking at the Dow 1 hour leaning against the recent low looking as innocent as you like just waiting for 2:30. Nice analysis @elle, Out of hours can be a pain overall but useful perspective. Interestingly for me the 2 drops you have highlighted with arrows both follow an A-B-C retrace pattern, well the current one isn't complete yet but still. If we are to see a rally out of this it will have to start at or soon after US open I feel. Quite normal to get an initial move the wrong way and then a turn into the trend for the day on opening, so that could be an initial further drop (call it a catch up on Asia and Europe drop if you like) and then a turn and rally. MY Daily Dow chart shows similar support level to yours around the 25,000 mark, a zone I had picked out before the current bear move. It also coincides with a supporting trend-line. Seeing on the 1 hour charts the indices are having another go at a push lower with FTSE tracking Dow this time. ...And in the time taken to write that they have all followed. Yeah but now the Dow has hit the 25000 support zone and bounced. Will it be sustained? Who knows? It initially powered straight through to 24890 nearly an hour ago before pulling back, only 20 min til US close so will be interesting to see what the Asian market think of it. It was most disconcerting yesterday morning to find on the Dow chart that my auto fractal support/resistance drawing app had been completely overwhelmed and I was forced to draw my own **** horizontal lines. This morning the same has happened on the Dax! When will this madness end? The FTSE has seen twice as much action out of hours of late than during a typical day with a continued drop then recovery to return to yesterday's close and similar story with the Dax which has just backed away from yesterday's high. Not too much on the calendar today though maybe something out of the G20 meeting. China and US to start trade talks again announced overnight may provide a boost. Dax taking off on the now, funny start on The Euro open Dax and FTSE took off in opposite directions and Dax had to shame faced turn around. 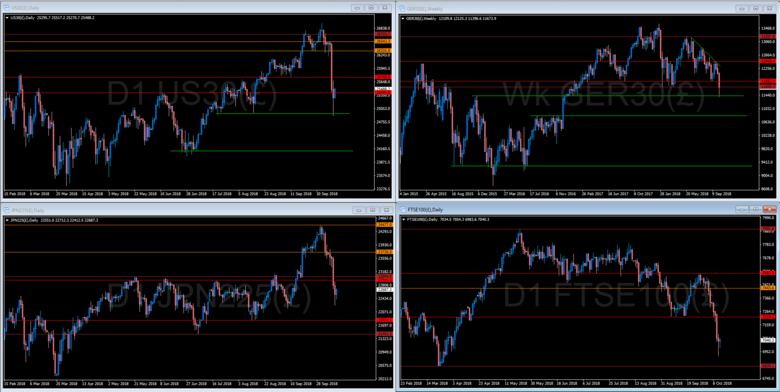 Dow/SP500 did it on Daily chart support whereas for Nasdaq and FTSE it was weekly chart. 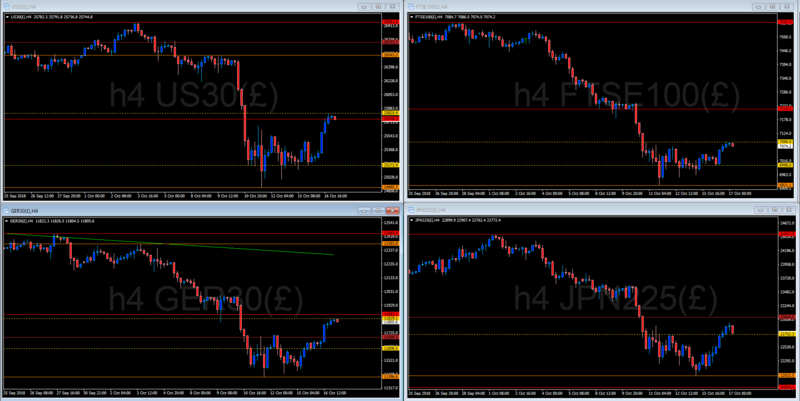 All 4 putting in something resembling an inverted head and shoulders on the 1 hour charts, with failed attempts to push lower on the last 3 candles could make for an interesting Friday afternoon. 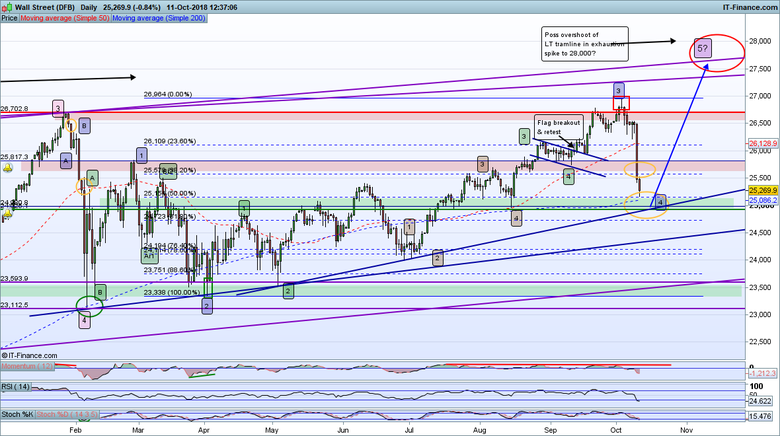 Start the week so a recap of the weekly chart and the big question is will Dow seek to retest the low at 24895 or look above for resistance? The 1 Hour shows Dow trapped in the same triangle pattern as S&P through there is a short term support level at 25200 and that level is key for the morning session. Dax on the 7 am Euro open is looking to push lower but lacks conviction and is waiting for the London open to decide direction. 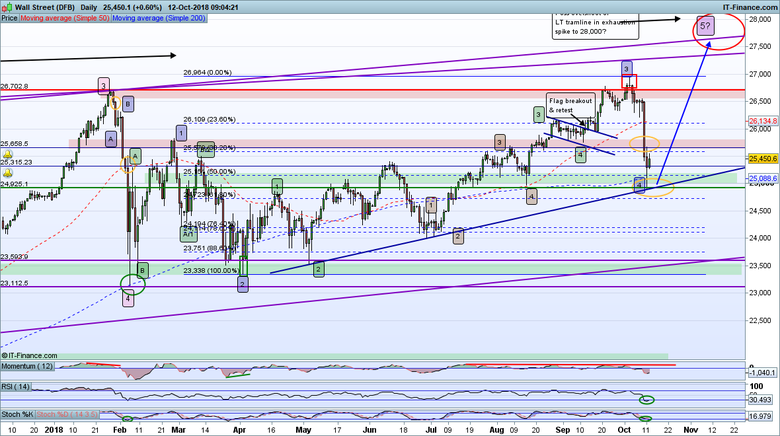 Dow puts in a doji 1 hour bar at the triangle upper line so not decisive either way. 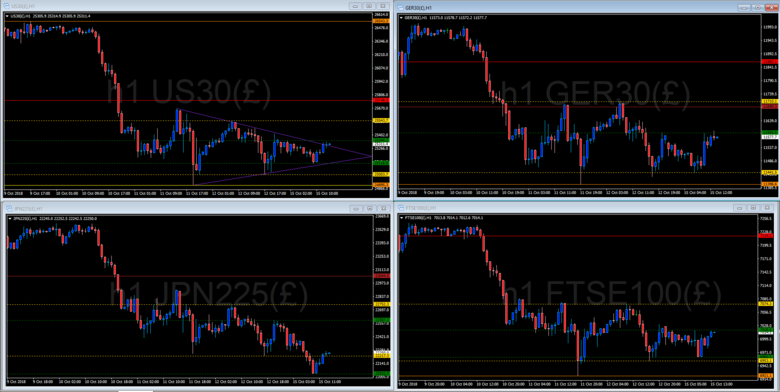 FTSE and Dax have bounced off support and hovering mid range. 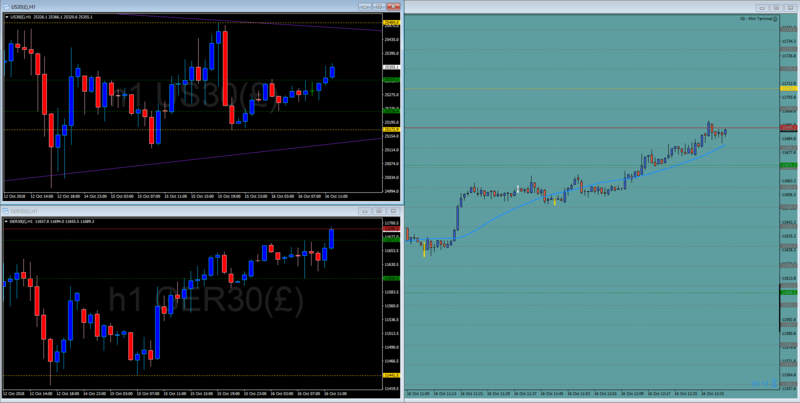 Looks like it's up to the US open (20 min) to make a move. The Dow giving an example of price just dribbling out of a triangle pattern sideways rather than exploding out up or down but is building on successive short term support levels to keep retesting resistance. 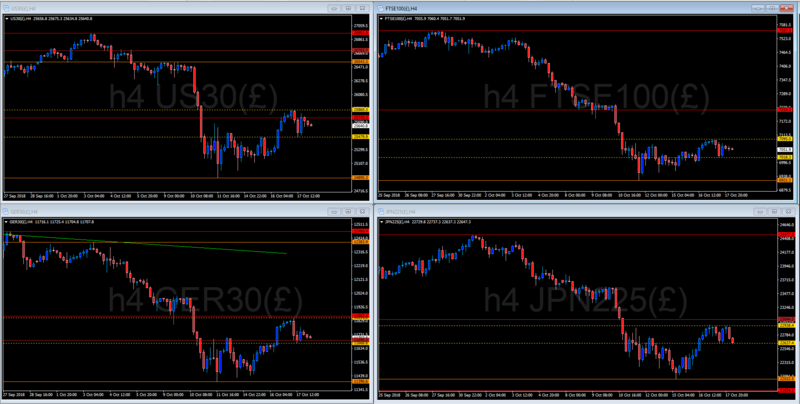 Currently looking for downside below 25172 or a test up of 25484. Dax is positioned well for a test of the old monthly support turned resistance at 11700 while FTSE looks to resistance at 7078. 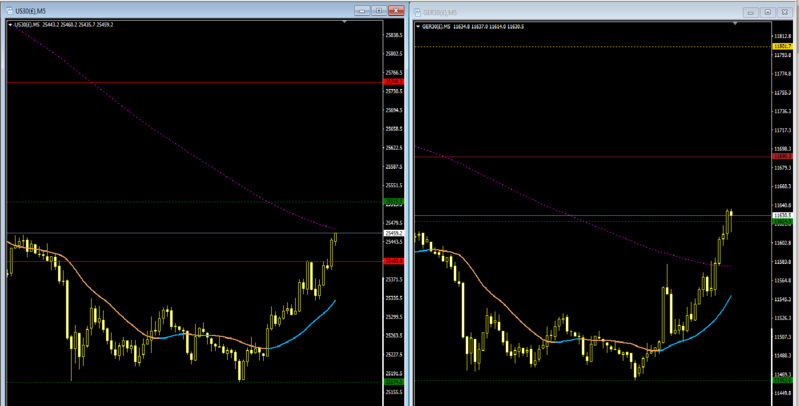 These two are following the recent Nikkei move up. The Dow daily is an interesting bear pennant made up of dojis, obviously bearish but these recent moves have been more sentiment based than technical. 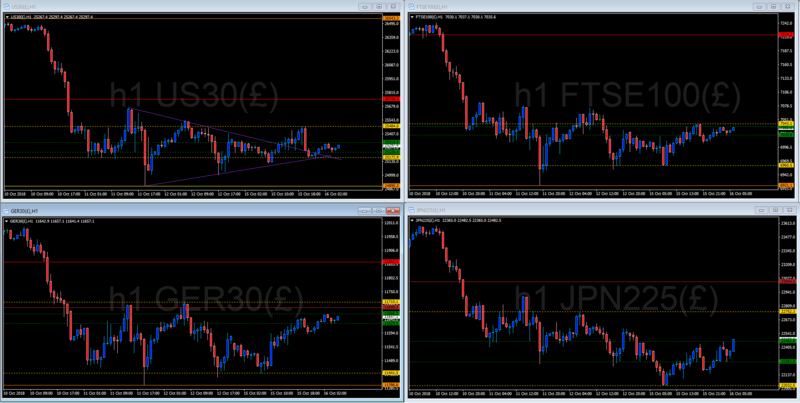 1 hour charts (note I have changed round the positions). 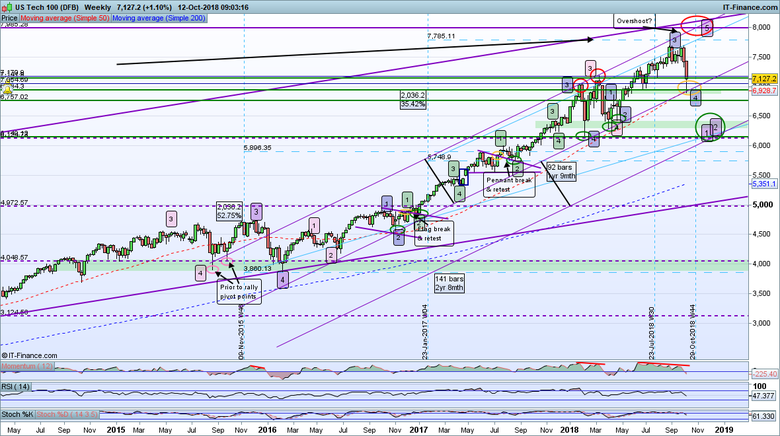 Dow has worked it's way back up to pause at it's previous weekly support level around 25748 and Dax has done the same resting at it's previous weekly support level around 11862 having broken up through it's previous monthly support level 11700 yesterday (dark red). 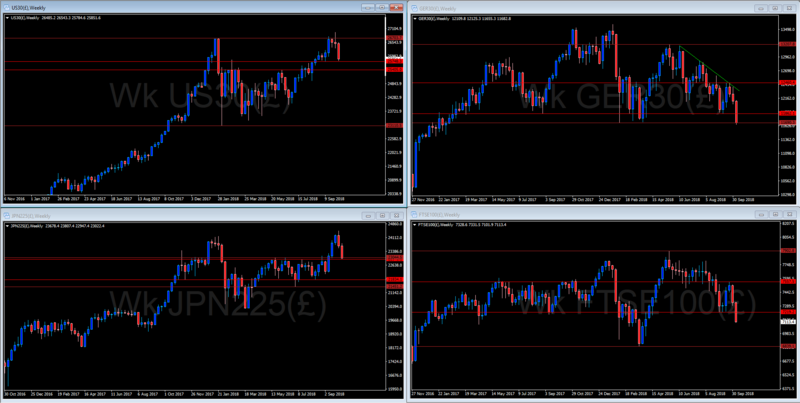 Nikkei and FTSE showing the same chart pattern as Dax and Dow. From these red levels maybe looking at a short retracement but could equally see a solid push through, the London open should decide it either way. 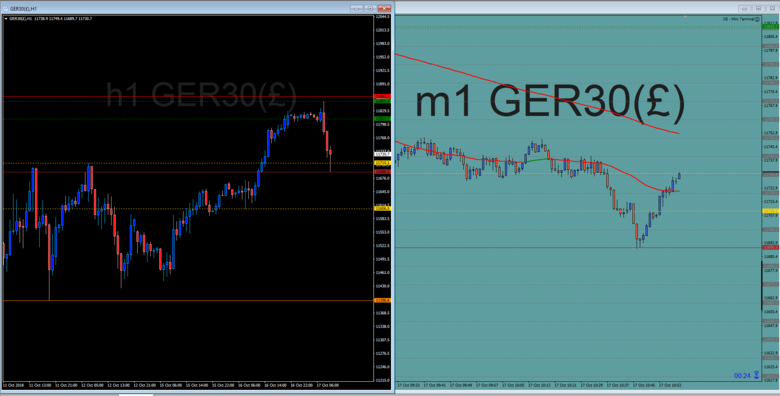 Dax taking a second look at 11690 and gets another bounce. 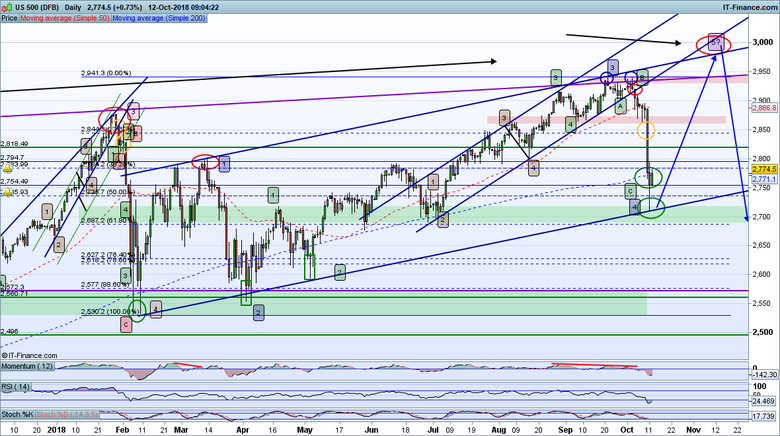 Can't go up because of Dow but reluctant to fall through this level, will have to if Dow keeps dropping. 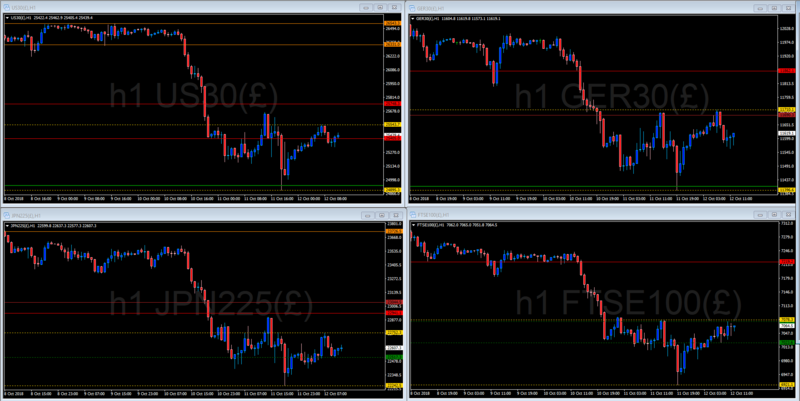 All 4 moving sideways in a short term range (yellows), Dax retesting the bottom with at the 7:00 am Euro opening, looks to be holding.